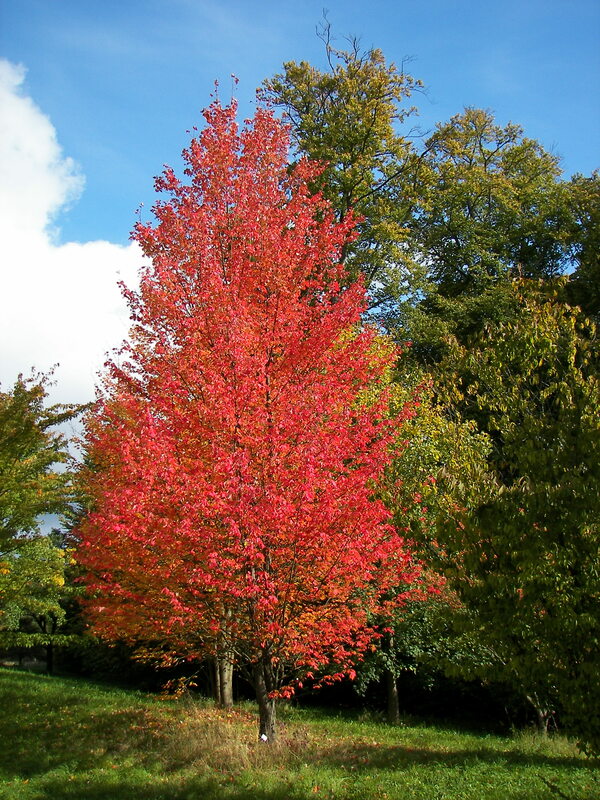 Red Maple, New Botanical Garden Marburg; photo by Willow. Courtesy of Wikimedia Commons. We’ve done the final walkthrough of the apartment. We’ve spackled the walls, vacuumed the carpets, and hauled out the last of our stuff. The only thing left to do is turn over the keys. Finally, this sad place is no longer my home. I’m here to dig up my flower bulbs, maybe some of the spearmint that grows by the front door. That’s about the only reminder this place I’d like to keep. It’s not that this was a bad place to live. We’ve been safe here. We’ve had abundance. We had two bedrooms, 1.5 baths, a washer/dryer and, though we lacked storage space and natural light, we did have a field of wild flowers right outside the slider door. The blood-red maple in the middle of the field has been my altar for the past four years. Its leaves remind me of embers, of Brigid. Goddess of the hearth, it was She who led us here when we needed a home. I’d prayed to Her, offered my devotion in exchange, and in the way of these things, life swept us up and delivered us on this doorstep where the wild mint grows. We’ve been blessed here. We just weren’t always happy – at least, not together. I think we’re past all that, now. We’ve found a new place, a house with lots of light and a fenced-in yard. I can start a real garden, not just this tiny patch of ground where strangers toss their cigarettes. One of the things that Brigid asked of me was that I start a garden. She told me color was needed here. So I’d tried to turn this little space between the sidewalk and the hedges into something beautiful, with meh results. My hyacinths did well in the spring, but my grandmother’s gladiola bulbs did not. The catnip got unearthed and the peppers succumbed to rot, but the first year’s tomatoes went crazy. They keep coming back. I gave the neighborhood children permission to pick them, as they will. Now I dig up bundles of mint and lay them on the stoop. As I consider their spindly, thirsty roots, I feel like there is something more I should be doing. Some ritual or gesture to show thanks, or maybe just mark the fact that I was here. He broke my heart, but we got through it. We did all right. I survived. I had planned to do something ceremonial before I left with the blackberries in the freezer (stashed for years since our first summer –- I’d meant once to bake a pie), or maybe the white candle that I’d used to perform two cleansing rituals that never seemed to take. But in the craziness and frustration of moving, we tossed those things out with the rest of the rubbish. Now I am here for the last time. I have nothing with me but a cardboard box, some paper towels, and a garden spade. As I step up to the door (barefoot), I think I’ll just have to make a silent prayer and hope that’s enough, because aside from thanks I have nothing to give back. Then I stub my toe on the threshold, drawing blood. I say some colorful things and reach for a paper towel, but then I stop. What can you give the Goddess who has everything? I think, and I laugh. The other thing that Brigid had asked of me was that I learn more about my heritage. I’d been a solitary pagan for years, but without direction. With Her push, I spent my time here learning what I could –- what we can deduce — about the religion of the Celts. I researched Brigid, of course –- a pan-Celtic goddess so beloved by Her people that they transformed Her into a saint and brought Her into Christian lore — but I’ve studied their archaeology as well. Their iconography. Their folkways. I know that sacrifice was part of worship to the Celts, be it in scraps of cloth tied to branches at sacred springs, votive statues and weaponry sunk into bogs or even -– yes -– living things propitiated to the Gods. I do not believe that living sacrifice is necessary in our modern age, but clearly there is something deeply intimate and symbolic about blood. I have fought many battles in this place. I bear scars. I am not the same woman who was led here. I have been transformed. And yet, part of this apartment will live in me, always. And part of me will remain. After I stow the uprooted mint in the trunk of my car, I make a bundle from the detritus of my garden; black bell pepper stems, strewn tomato leaves, the dying stalks of my gladiolas. Then I walk, barefoot and bleeding, into the field of wild flowers. This is my offering. Blood and others fruit of my garden. I lay my bundle at the base of the blazing red maple tree, and say goodbye. For the next family that She brings to this doorstep, I leave the wild, tenacious tomatoes. Oh, and the hyacinths, which I decide not to dig up after all. They are sleeping now, but in the spring they will come back again -– little well-wishes of color to surprise them after the long, dark months of winter.